sum-up of the wedding vibe: A small, rustic, forest wedding with multicultural elements and lots of DIY. 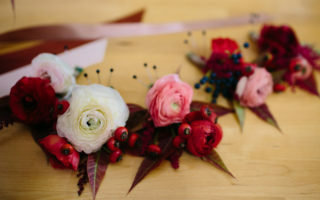 We allocated most of our budget to securing the venue, the caterer, and photographer (everyone said the day would by super quickly, and we wanted beautiful photos). We didn’t want to coordinate too many vendors, so we went with a caterer that made our dessert (a tiered cupcake stand). Also, in a bit of a last-minute decision, we hired a day-of coordinator who really helped us so much with the day! We don’t know what we would have done without her. We made our own playlists and rented speakers, which worked well. We actually purchased a small speaker for the ceremony that we still use in our home today. Crystal had two outfits, but the red dress for the tea ceremony was purchased secondhand, and Jorge’s entire outfit was from Banana Republic. The white dress for the forest ceremony was actually a re-wearable short dress from BHLDN with a tulle skirt layered over it. We only hemmed the length of both skirts. We didn’t have a wedding party, which saved us some money in terms of flowers, decor, makeup, clothing, etc. (We were trying to keep things as simple as possible, and felt that we wanted to coordinate the least number of people.) We asked a friend to officiate and put together our own ceremony script/ritual that felt right for us. I wanted to feel and look like myself, so I did my own makeup and hair. We like to design and make things by hand, so we made all the decorations (we made little terrariums with succulents and lights for centerpieces), painted the table cards, painted the map canvas guestbook, and designed and printed our signs. We actually bought our flowers from several grocery stores in the area, including Trader Joe’s and Whole Foods. We spent the night before the wedding taking apart several bouquets to put together the flower crowns, the wedding bouquet, and the flower circle for the ceremony. The redwood forest grove was really beautiful that day, and we loved the feeling of being surrounded by nature. Having a day-of coordinator was great and helped everything run smoothly. We love the vibe of our photos, and this was probably the only time all of our family and friends would be in the same place (people flew in from Taiwan, Mexico, and all over the States), so we wanted to capture the day. For us, we also liked not having a wedding party and getting ready by ourselves; it really helped keep our stress levels down the whole day. We’re both quite shy and introverted by nature, so the idea of having too many people around while we were preparing seemed stressful. We didn’t resonate with a lot of the existing ceremony text, so we cobbled together some writing we liked with some poems, and we did both a ring exchange and a hand fasting ceremony. We also did a tea ceremony with both sets of parents (in a nod to Crystal’s heritage), and it felt quite emotional (maybe even more than the actual ceremony). Making all the decor was really fun in the end. We love painting and crafting, so it was one of our favorite parts of preparing for the wedding. Jorge sculpted our octopus cake toppers. Nothing, really—other than a few initial disagreements, we enjoyed the preparation and crafting all the details ourselves. We sometimes felt pressure to make and coordinate everything ourselves. Initially, we didn’t think a coordinator would be worth it, but we are so glad we ended up hiring Leah from Two Perfect Events. 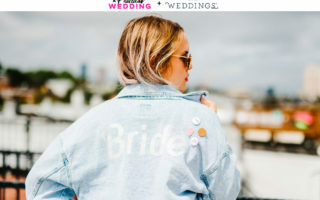 Researching the many ways people have personalized and designed their own weddings helped us figure out what we wanted to do (thanks to sites like APW)! Our vendors, who we mostly found through reviews online, were all great and helped us figure everything out. We never felt pressured to pay for something we didn’t want, and they all had great communication. Follow your intuition with making decisions and don’t worry about what other people may or may not think about what you choose to do or not do. The venue! The atmosphere was so beautiful and magical with sunlight streaming through the trees. We are planning to go back and visit!